The Hockey Blog Adventure: Offseason Hijinx: So, who is this Tuukka Rask kid? Offseason Hijinx: So, who is this Tuukka Rask kid? There’s this guy, plays for the Bruins. He likes to stand between the pipes, and he doesn’t like to let the puck past him. He’s lost four games in the playoffs so far. He had some moderate success in Europe before coming to the USA to play the pro leagues here. And his name is not Tim Thomas. For starters, he’s much younger. Born March 10, 1987, Tuukka Rask is only 22. He’s also a little taller, and a little skinnier than Timmy T, and is building a similar reputation wearing Black and Gold. He first came to Boston when Toronto (who picked him up 21st overall in the 2005 entry draft) decided they’d rather have a tested veteran goalie in Andrew Raycroft than a green rookie from Finland whose only notable statistics were, oh, I don’t know, playing for the Ilves Tampere Junior A team and putting up a 1.86 GAA in the regular season, and then upping that to 0.87 GAA in the playoffs (with a .973 save percentage) on his way to 9 wins in 10 games with 6 shutouts. And that’s just when he was 18. Two years later, representing Finland at the World Junior Championships, he posted 2.11 GAA and .940 save percentage, and was given Top Goalie honors and named to the All-Tournament Team. But enough about his childhood. He’s a Bruin now, what has he done for us? First, he’s been pretty solid for the P-Bruins. In his first season (07-08), he allowed 1 or 0 goals in 18 games out of the 45 he played. That went a long way to his 2.33 GAA and .905 save percentage. Not terrible for a rookie. 27-13-0-2 was his record, with 1 shutout (March 19 2008, 27 saves). 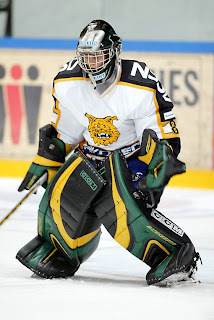 He also got to play a game for the grownup B’s, which he won 4-2 against They Of Little Faith, the Toronto Maple Leafs (November 20 2007, 30 saves). During December of that year, he put up 1.83 GAA and .924 save percentage. Won his playoff debut April 16 in overtime against Manchester (The Kings’ Monarchs) and got his first playoff shutout two days later against the same chaps. He won six straight playoff games that year, and was voted by his teammates to be the team’s rookie of the year (Martone Group Rookie of the Year award). They were eliminated in the second round by Portland. His play held up during the preseason for this season, where he posted a .952 save percentage, beating out those guys we know and love, Tim Thomas and Manny Fernandez, who were both below .900 for the camp. The big guys decided he could use more pro experience, and I trust their decision. Tim Thomas played out of his mind this year, which is a big part of the reason the Bruins got where they did (the scoring a lot part didn’t hurt either, but that makes a second tangent, and that’s just too far. Back to the man at hand). 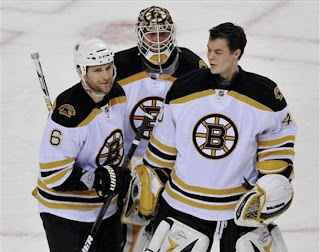 Tuukka played another huge year this year, 57 games of 2.50 GAA, .915 save percentage hockey. His record of 33-20-0-4 with 4 shutouts showed a contribution of 61.4% of the possible points over his 57 games, which was better than the team’s overall 58.8%, but now I’m just getting nerdy. He also played a little bit in the NHL, 60 minutes to be precise. You may remember the game against the Rangers at home on January 31. Tuukka made 35 saves on 35 shots which, according to most people, constitutes a shutout. He then wound up back down with the P-Bruins to finish their strong season (2nd overall in the East). In the playoffs, Tuukka is now continuing his steady play. In his 13 games so far, he’s got a 1.76 GAA and a .943 save percentage, which I find to be pretty good. He’s 9-4 in those games, and the P-Bruins are currently tied with the Hershey Bears (Battle of the Mascots), one game to one, as the Bruins come home to Providence for three games. So where to from here? Well, first there’s the rest of the playoffs. We can’t look too far ahead of ourselves, because it’s the Eastern Conference Finals in the Calder Cup playoffs, and the Bruins-Bears winner will be playing the Moose-Aeros (a much less-interesting mascot mashup) winners for the ultimate minor league prize. But what about next year? Well, with Manny an expensive UFA, we will likely not be seeing him, which would definitely give room on the bus for Tuukka to sit down, but at the same time, signing Tim Thomas for a lifetime supply of Bentleys didn’t help Tuukka’s $3.2 million cap hit self. While I, being an unnecessarily large homer, want the Fin to see a good chunk more time in the spotlight wearing Black and Gold, I worry that the numbers won’t add up (or, rather, will add up too much). For now, let’s watch the Calder Cup, root root root for the home team, and watch as our best goalie prospect protects Providence’s pipes while going for the prize. I, for one, hope we get to see a whole lot more of this kid. GO BRUINS! You're just trying to rub it in our face, aren't you? Well two can play at that game! SCOTT WALKER - He punched the Bruins in the face and the metaphorical gut. Next year Round 1 - Leafs vs Bruins. You heard it here first. I would welcome that series. haha, so true. If the leafs had made it, we would be way more likely that we have a whole-original-6 final four. Man...less than a year later...and where is this kid now? !